Every year I'm a month (or five) behind the "word of the year" bandwagon. I didn't post my word of the year until May (yes, you read that right) last year. So, despite my tardiness I'm way ahead of last year's schedule. I've read several things about living the abundant life lately, and I've decided that's my goal for this year (and every year hereafter). I want an abundant life, and that's far from what it may appear to be at first glance. ...the abundant life does not come to us packaged and ready-made. It’s not something we can order and expect to find delivered with the afternoon mail. It does not come without hardship or sorrow. The abundant life isn’t something we arrive at. Rather, it is a magnificent journey that began long, long ages ago and will never, never end. You can click here to read his entire message (and might I suggest you do, such a good read!). I tend to relate my abundant life to the latter list. I think the reason I love the phrase ,"the abundant life" so much is because that's what I want to provide for others, and in turn my life will be abundant as well. I want to make our home life (for my husband and boys) abundant. I want to do simple acts of service for others that will bring a hint of abundance into their lives. I want to enjoy abundance 365 days of the year, regardless of my circumstances. And I believe that is possible! 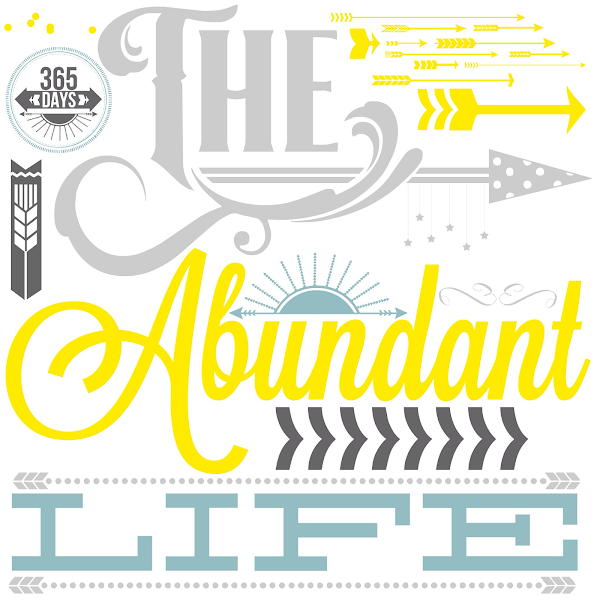 What would/does your abundant life look like? I really love the idea of focusing on living abundantly....beautiful printable!